britannia Industries Ltd has decided to remove trans fats from its entire range of baked products by the end of this year. The reason, company officials said, was growing scientific evidence of trans fats affecting health adversely. It is reducing trans fats by switching from vanaspati to palm oil-based products. Palm oil is the cheapest oil in the market (see 'Fat of the matter', Down To Earth, February 1-15, 2009). But K D Yadav, technical adviser, Vanaspati Manufacturers Association of India, said the issue is exaggerated. 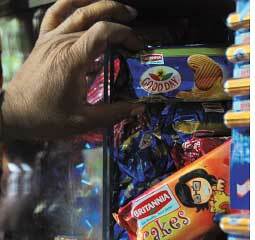 "In India, vanaspati consumption is about 10 per cent. Most people don't cook in vanaspati since everyone has become so health conscious. Everything depends on how much we are consuming. Our consumption of fat is low." Vanaspati, however, is an integral part of the bakery industry. Britannia initiated the process of becoming trans fats free in 2006 and has removed it from about 98 per cent of their bakery products--which translates to 8,500 tonnes of trans fats in the past 18 months. The company said the move had not affected the price or quality. "Though the prices have changed in the past 18 months, this is not because we removed trans fats from the food. Cost inflation due to prices of raw material increasing has affected the entire industry," said Anuradha Narasimhan, Britannia's director, health and wellness.